Amazon River Dolphins is a website that promotes and supports science investigation in a project-based learning environment for grades five through eight. This website provides classroom teachers, worldwide, with experience in web-delivered instruction and is organized in such a way as to enable them to facilitate an active and meaningful learning experience for their own students. Students benefit from learning scientific observation and research skills, helping them to develop their own understanding and appreciation of biodiversity and conservation. Special emphasis is placed on females as role models and leaders in science and technology. The bilingual website enables Spanish-speaking students and teachers to participate fully in the project. Model and facilitate web-delivered, project-based instruction. Provide an opportunity for teachers to develop their own skills in the area of scientific observation and analysis. Provide an opportunity for teachers to collaborate with scientists engaged in scientific research. Allow teachers to apply for Continuing Education Units (CEUs) through a San Francisco Bay Area college. Enhance students' scientific observation and research skills. Develop students' understanding and appreciation of biodiversity and conservation. Broaden students' cultural perspectives and awareness. Heighten and promote girls' self-confidence and self-esteem in the areas of science, math, and technology by providing female role models and engaging learning activities. Provide access to expedition information for Spanish-speaking students. Inspire and empower students with the knowledge that they can affect positive change in the world. Instruction is organized around a freshwater river dolphin research project being conducted by Tamara McGuire. Expedition events and scientific data will be uploaded to this website each day of the journey allowing teachers to participate in the expedition as it takes place. Teachers will be able to exchange electronic mail with expedition participants and researchers. In addition, research and information on Peru and its people will be gathered the following week and archived for posting to the website upon return to the United States. The website is organized into five broad sections to support the defined instructional goals; "Getting Ready," "Peru & Its People," "River Dolphins," "Taking Action" and "Teacher Resources." The website will remain active for the 1999/2000 and 2000/2001 school years allowing teachers and students access to the site's information, scientific data, and resources. Additionally, new information will be uploaded to the website begining spring of 2000 as Tamara continues her research. Student-centered, project-based instruction is essential for learning to occur. Students of all ages need to relate new information to their own experiences and existing knowledge, and they need to be actively engaged in constructing new knowledge. Units of study should be cross-curricular and teaching methodologies should address students' varied learning styles. In this model of instruction, topics are presented in such a way as to stimulate the learner's innate curiosity and are designed to reflect real-life experiences as much as possible. Assessment serves to provide learners with insight into their own learning processes and seeks to help them identify areas for future growth. To facilitate this type of learning, each section of Amazon River Dolphins is organized around essential, open-ended questions that teachers and students will answer for themselves based upon the information and resources provided on the website, their own research, and other available local resources. At the conclusion of the unit, students are encouraged to apply their new knowledge to projects of their own design. What does it take to live on a boat for a week deep in the Amazon rain forest while studying river dolphins? "Getting Ready" will explore the personal characteristics and personality traits of people who venture into the unknown by focusing on the Amazon River Dolphins expedition team members, researchers, Oceanic Society staff, and crew members. Many of these people will be interviewed prior to the trip as to the questions below and their responses will be presented on the website in a personal "diary" format. Photos pertaining to getting ready for the journey, excerpts from journals, packing lists, required vaccinations, etc. will be included. Special focus will be placed on the wildlife biologist and her career. 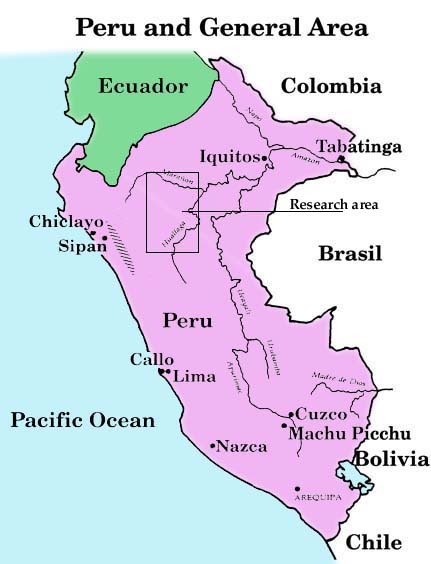 Who are the people of Peru? What influences have shaped their culture? The geography, culture, language and people of Peru will be the focus of this component. Included will be profiles of people encountered along the way. Each profile will follow a common template of information (to include a day in the life of, personal goals, educational experiences and parent and/or cultural expectations). There will be background information on the geography, economy and various cultural groups of Peru allowing for students using the website to compare and contrast their own experiences and environments. Special focus will be given to those people living along the Amazon River basin. What are the conservation needs of the fresh water river dolphins living in the Pacaya-Samiria National Reserve? By posting to the website a description of each day's events and data collection, a model of scientific inquiry and methodology will be provided to students and their teachers. Students and teachers will be able to observe how scientists formulate questions, collect and analyze data and draw appropriate conclusions. Much of the interactivity of the research will take place on our web board. A place where questions can be posed by anyone involved and others may answer. Additionally, there will be scientists working in related fields who will be available to answer students' emails on questions pertaining to the research project or other areas of interest. How can one person make a difference in the world? In his or her own community? The participants' and scientists' thoughts and feelings about their experiences while on the expedition will be included on the website. Participants and scientists will be asked how their expectations concerning the expedition have been met, if they have gained new knowledge and/or insights because of the expedition, and if the experiences they have had during the expedition will in any way change their future behaviors. Students will be encouraged to locate someone in their own community who has made a positive difference and interview that person, if possible. There will be suggestions and resources available to encourage students to become active in a project of their choosing, either locally or globally. Additional resources (books, URLs, articles) will be posted to the website for teachers.